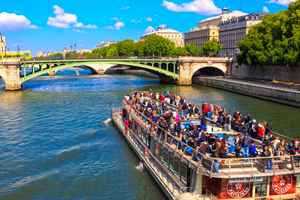 Admire the main sights of Paris from on board a boat on the Seine! Enjoy the charms of Paris on board a tourist boat: admire the most beautiful sights of the French capital during an hour long cruise along the Seine. Let yourself be enchanted by views of the imposing Cathedral of the Kings of France, the famous Louvre and the magical Eiffel Tower during a relaxing and enjoyable boat trip. The beating heart of The City of Light will unfold before your eyes from a different perspective, possibly the most enchanting of all, with the reflection of the lights and sights of Paris in the waters of the Seine. A cruise along the River Seine has always been one of the most enchanting ways in which to see the French capital. With a boat trip that lasts about an hour, you will have the chance to discover the magic of some of the most prestigious monuments in Paris, embellished by the romantic reflections in the glimmering waters of the River Seine. Hop on board and visit the most iconic monuments in the historic heart of the capital: the Eiffel Tower, the Cathedral of Notre Dame, the Louvre Museum and many more besides. Just take the option to relax and enjoy the panorama that unfolds around you as you listen to the audio guide in English which is included in the price of a ticket. Discover the real Paris in comfort, seated on board a boat: start your journey at the foot of the Eiffel Tower, cruise along the Seine for about half an hour and then take the the return journey back towards the magical Iron Lady. On the day of your visit: simply show the tickets on your smartphone at the entrance to pontoon No. 3 / Line A. The river cruises operate at different times depending on the time of year. The boat trips with a single ticket (cruise only) stop at 13:00 and at 19:30. During these specific time slots, it is possible to purchase a boat trip with lunch or dinner included in the cruise. We would also remind you that the timings may change subject to the weather. During the months of June, July and August: from 10:00 to 23:00 with departures every 30 minutes and the last sailing at 22:30.